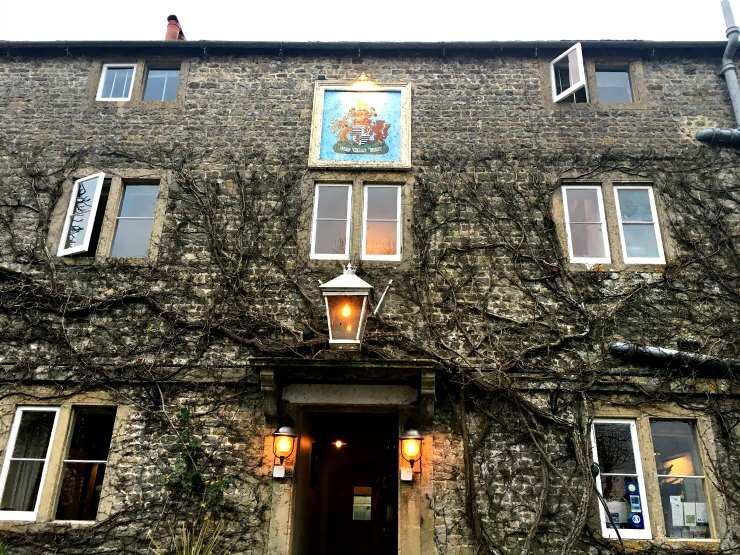 Within the Longleat Estate, famous for its country house and safari park, is a country pub with rooms called The Bath Arms. 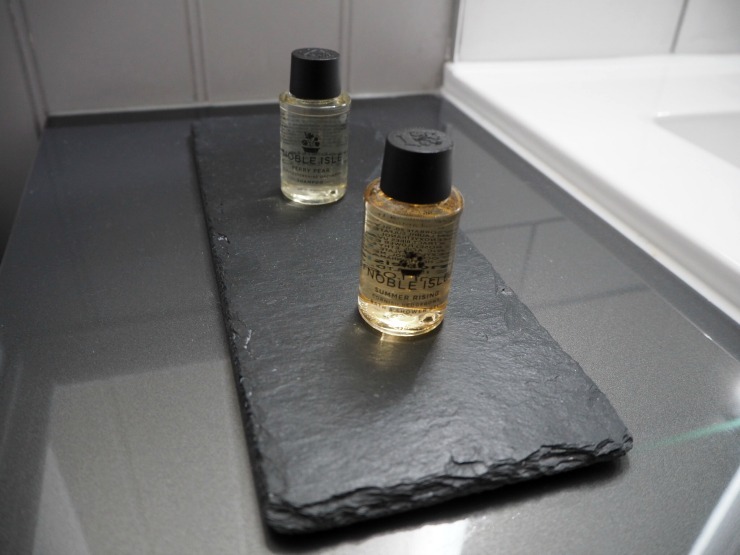 It's the perfect place to stop overnight when exploring Longleat or the beautiful Wiltshire countryside. An added bonus is the beautiful city of Bath is only 20 miles away. 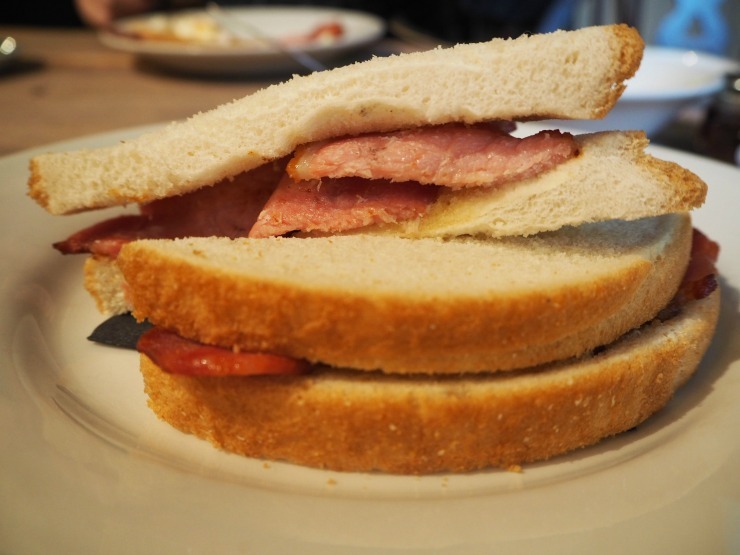 I was invited to review the accommodation and food recently, on a complimentary basis and report back to my readers and this is what I thought. After a two hour drive from South Wales down picturesque country roads, Mr W and I arrived at the Bath Arms. 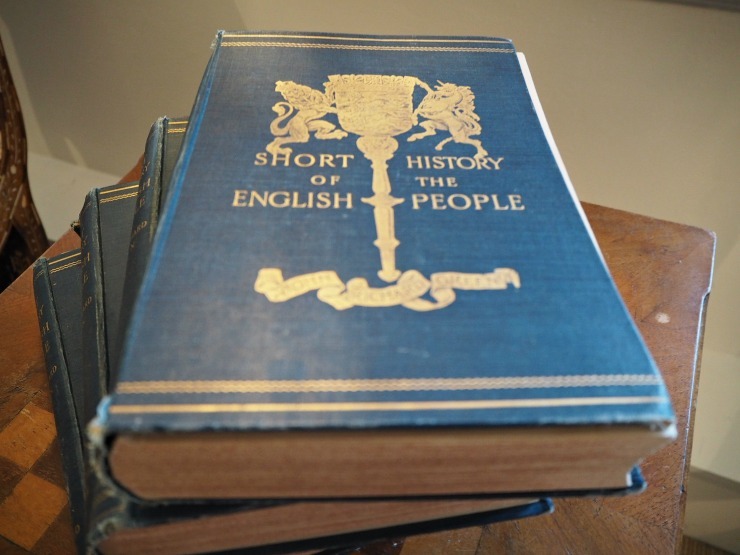 First appearances were good of this well-preserved country pub with rooms. Check in was a simple process at the bar and before long we were shown to our room. The room we were given, the Fallow room, was a superior room and was a reasonable size. 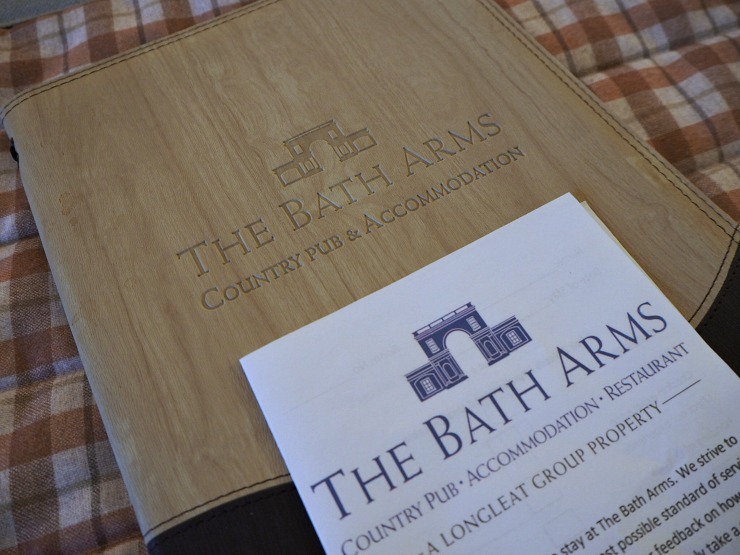 All rooms are slightly different and individual in The Bath Arms. 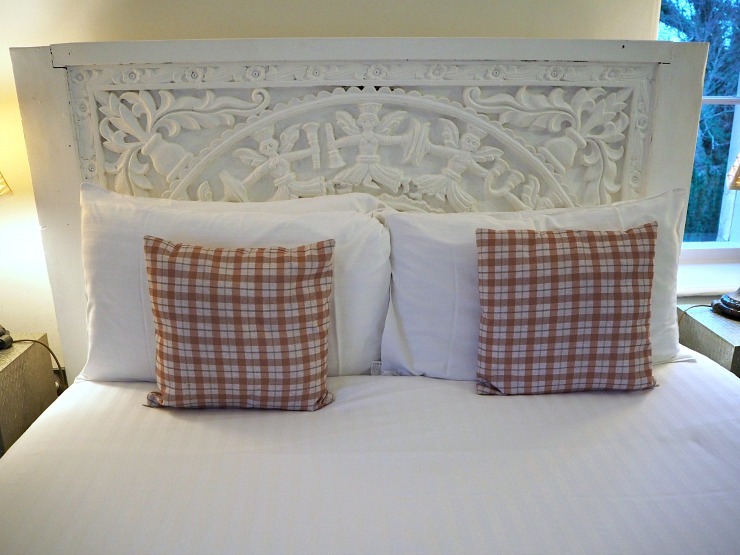 Our room was decorated in muted shades of beige and white with a red check throw and good quality matching cushions. The side tables and chest of drawers had an opulent feel with a silver inlaid design. 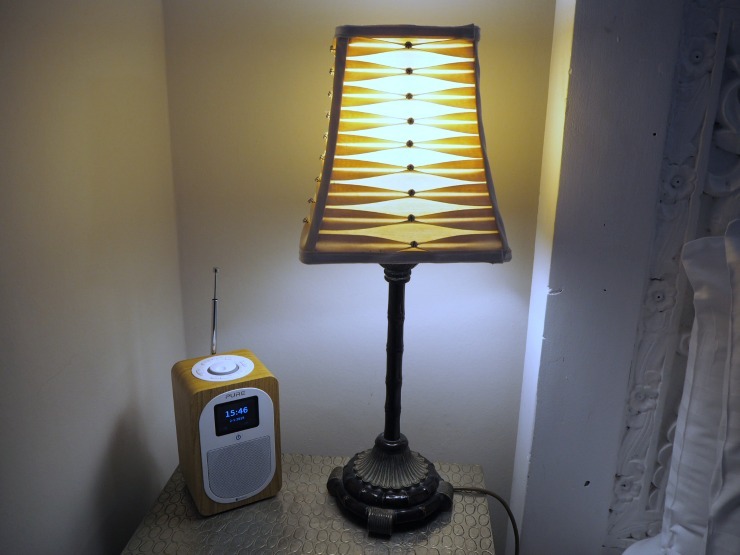 The antique style table lamp was a nice touch as well as the DAB clock radio, a great mix of modern and traditional touches. 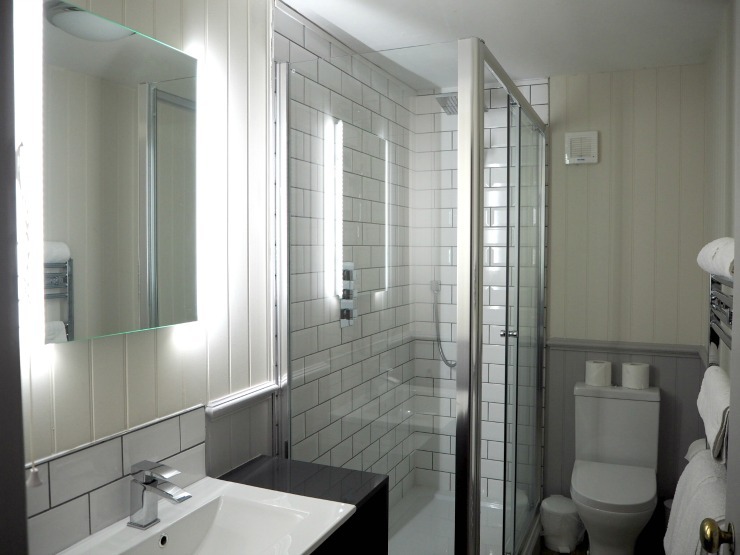 The bathroom was chic and modern, in black and white with a white tiled rainfall shower. Everything was spotlessly clean, and although it wasn't large the bathroom was perfectly formed. I liked the touch sensor light on the bathroom mirror. Toiletries of shampoo and shower gel were provided but unfortunately no conditioner. Maybe this is something they could consider adding to the room in the future. A hairdryer was provided and which is always nice to have. Towels were good quality and bathrobes were also provided. In the room, we had two bottles of complimentary water, tea and coffee and a packet of biscuits. It would have been nice to have more biscuits as two biscuits in a pack for two people isn't generous. I've noticed this with many hotels and not just here. 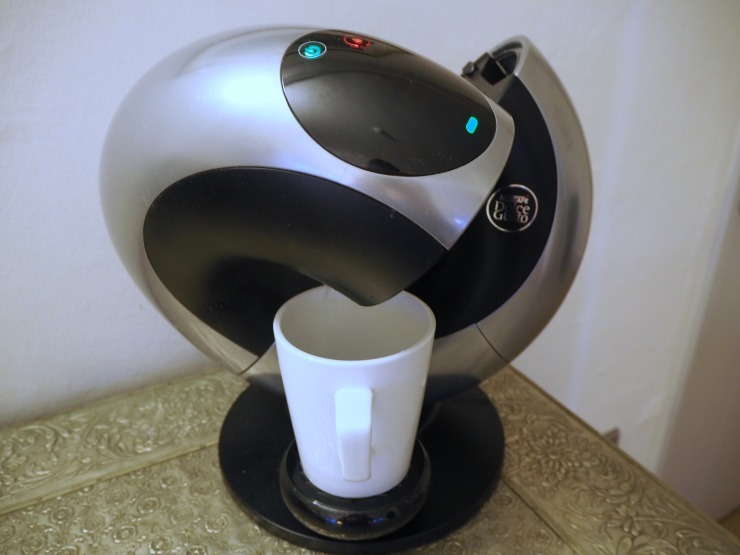 Now if you like coffee you would have been impressed with the Dolce Gusto coffee machine. It really was a state of the art machine! 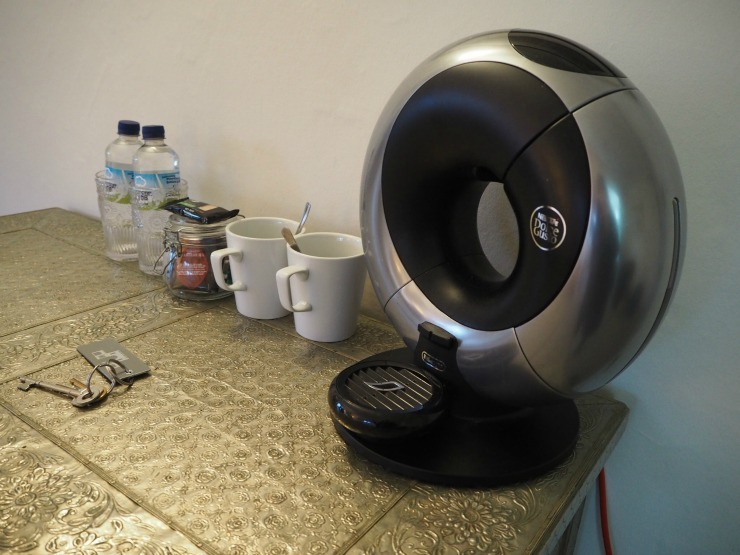 The manageress who showed us to our room did say that a kettle was available if required as some people find the coffee machine complicated. Mr W had no problem using it but it wasn't the simplest machine I admit, still, it made a great cup of coffee. 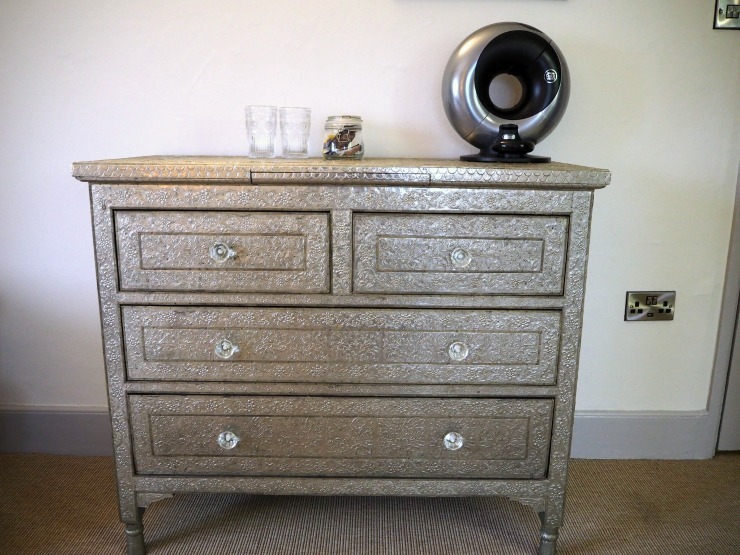 The design of the chest of drawers was gorgeous, covered in a metallic embossed finish - really different and unique and it matched the side tables too. 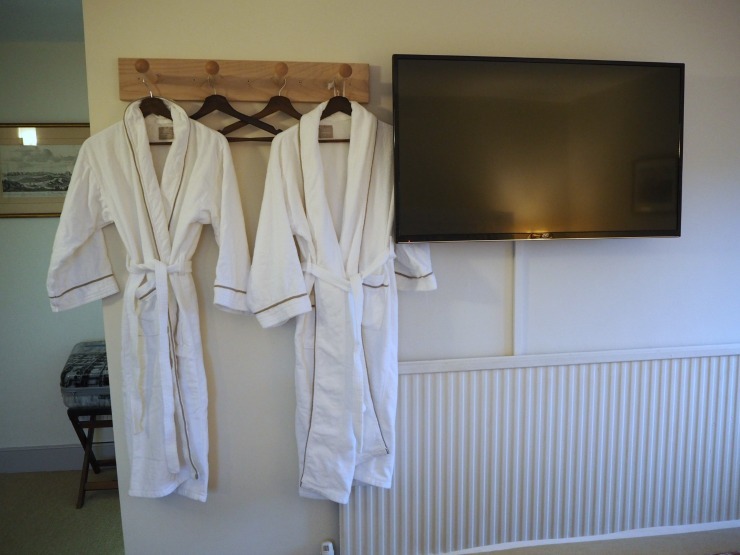 There was no wardrobe in the room and some could argue that this was a design feature, instead, there were coat hooks with hangers provided to hang up clothes. Next to this was a large smart TV with built-in DVD player. What I did notice was there were plenty of plugs and USB chargers in the room. Information about the surrounding area and the accommodation was provided in the room. 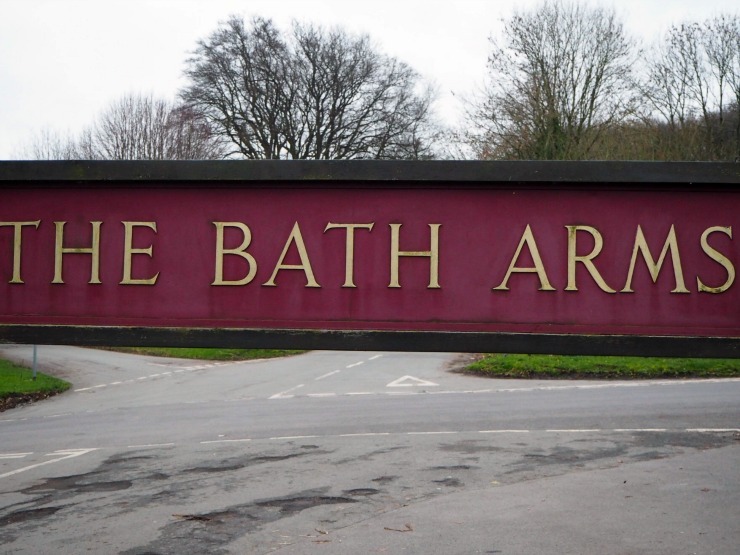 The Bath Arms is only a stone's throw from Longleat House and adventure safari park and you can book Longleat experience packages through the pub. 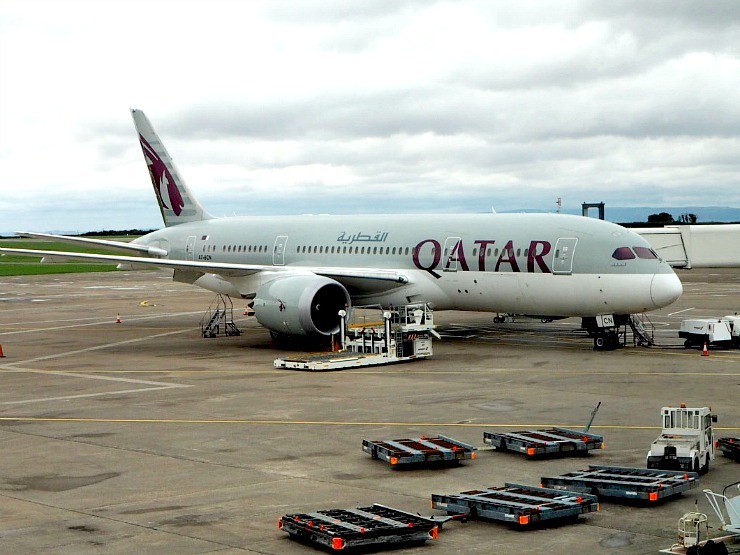 Useful if you want to book a surprise trip away for a loved one. 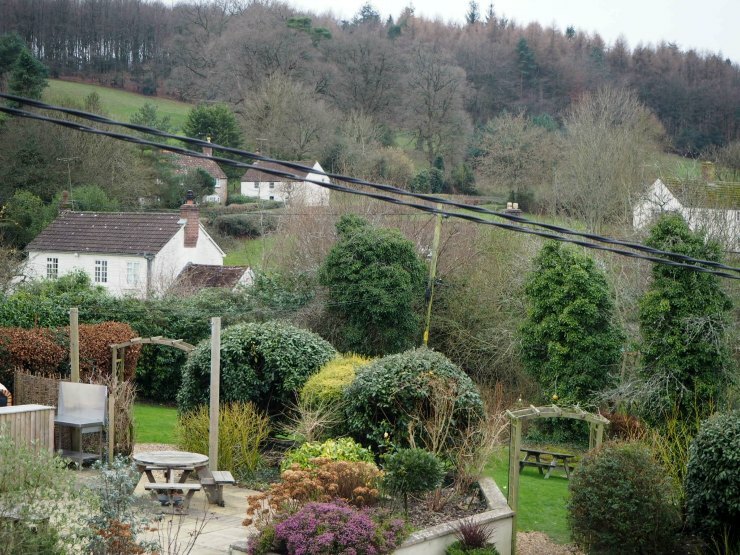 We had some beautiful views from the room of the countryside around, and I bet on a hot summers day the outdoor courtyard area is a great place to sit with a glass of wine or a beer. 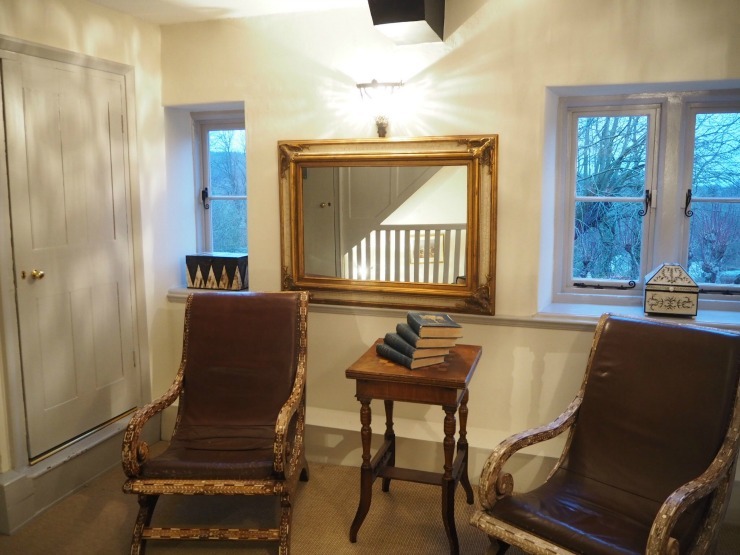 Our room was on the first floor and to get there you pass a small seating area with vintage looking chairs and a pile of old books, all adding to the rustic charm. Dinner that night was downstairs in the pub. 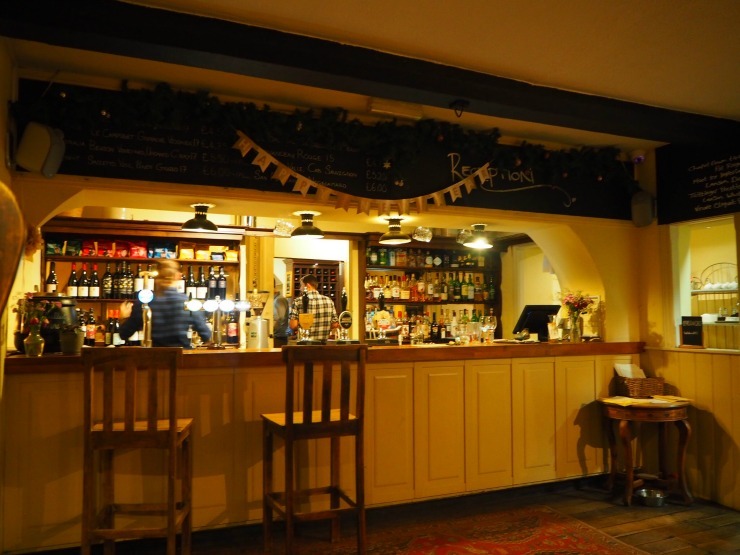 There is a cosy bar area as well as a separate slightly more formal dining area. The food sounded delicious and was an interesting mix of traditional British food, including game and adventurous vegetarian dishes. 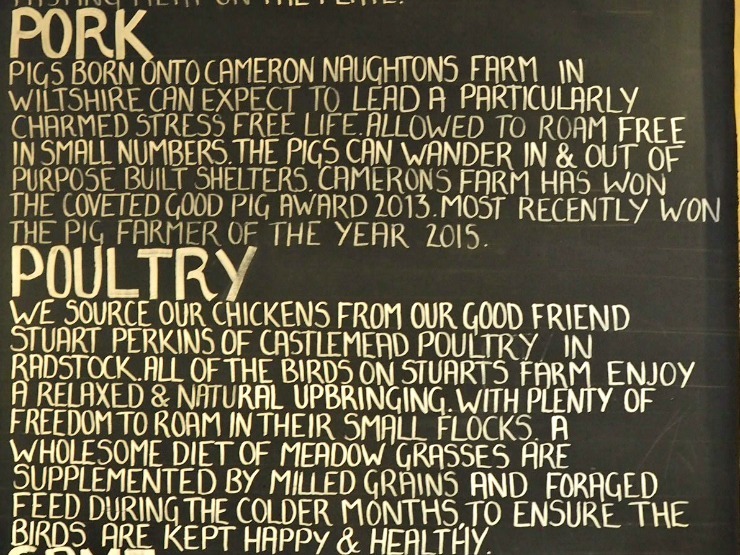 I was particularly impressed that the meat they use is local and free range. After perusing the menu I decided to go with scallops, venison and apple crumble whilst Mr W went with the selection of bread and oils, and a chickpea and polenta Panisee with a chocolate brownie for dessert. The whole menu sounded great. My scallops were presented as a work of art and looked fantastic. 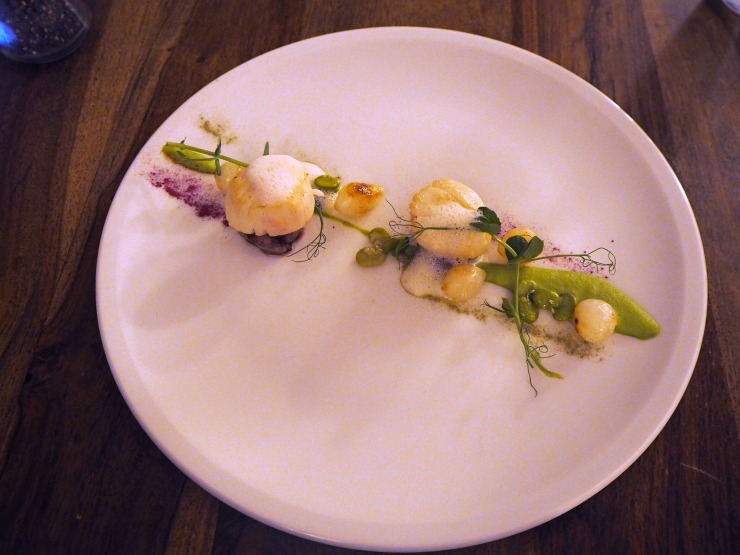 The scallops were perfectly cooked and were presented on slices of lamb with a pea puree. I think a little more seasoning would have lifted this dish up a level though. 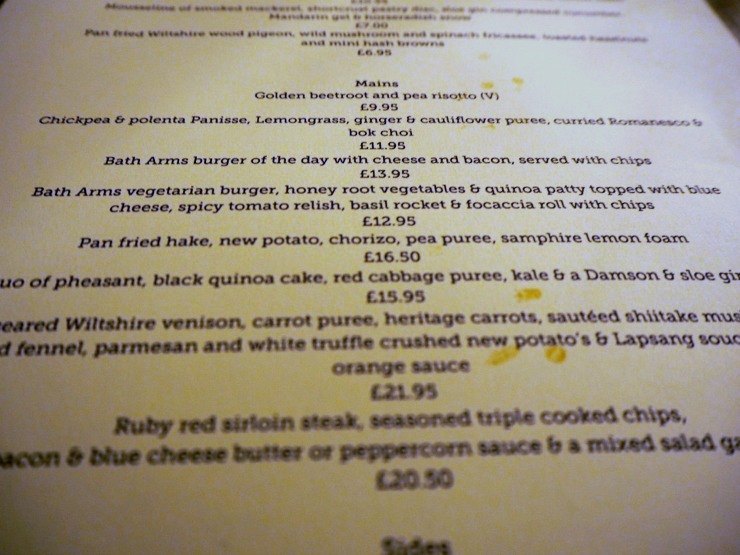 I was unsure about ordering the venison at first, and I was hoping it didn't have a strong gamey flavour. I shouldn't have worried. 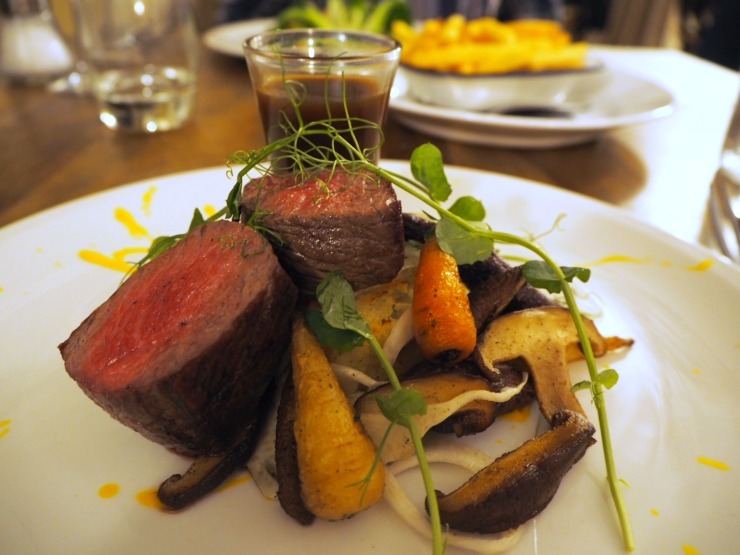 The venison from Wiltshire was served pink and tasted delicious. With a flavour similar to beef it was served with roasted carrots with a hint of sweetness and nestled on a bed of fennel, shitake mushrooms and crushed new potatoes. A drizzle of orange and lapsang souchong jus added a citrus touch. A very good main course. I managed to squeeze in a pudding. 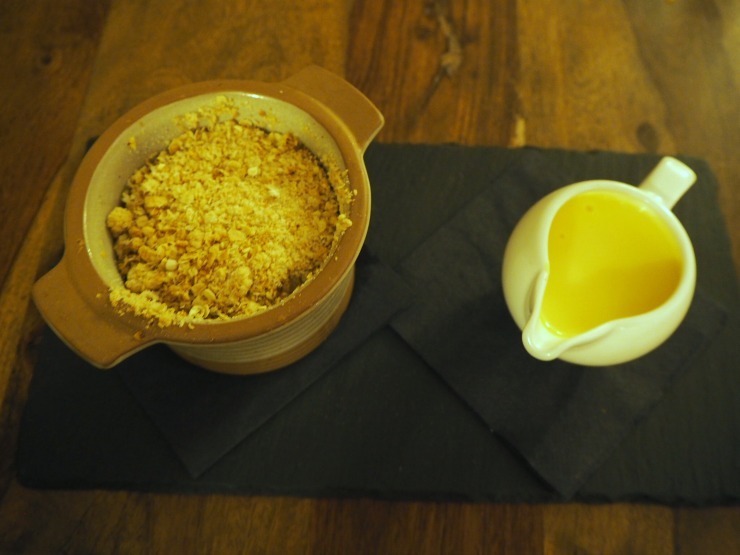 Well, it would be rude not to, wouldn't it, especially when I saw a favourite of mine on the menu - apple crumble. Now, this simple dish can often be neglected or tweaked too much - it can be too sharp, it can have an oaty topping, or the fruit can be mixed with others. This was simplicity at its best, sweet apple, crumbly flour and sugar topping and creamy vanilla laden custard. Perfection. Mr W enjoyed his dishes but was quick to eat them. 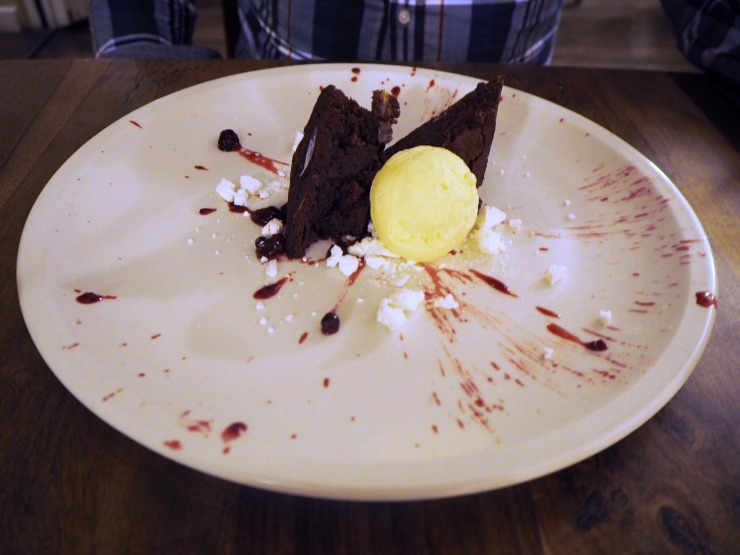 I did, however, manage to snap a photo of his dessert which looked amazing and tasted gooey and delectable. Well I had to try it, didn't I? After our meal, we went to the bar for a couple of drinks. 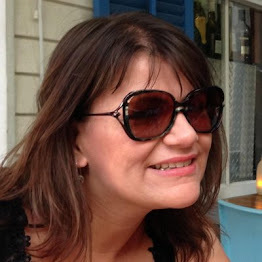 I was impressed with the selection of champagne and cosy atmosphere. The next morning we had a comfortable night sleep but were awoken by children jumping around upstairs. I guess with old buildings like this you could have noise from other guests and is something to bear in mind. 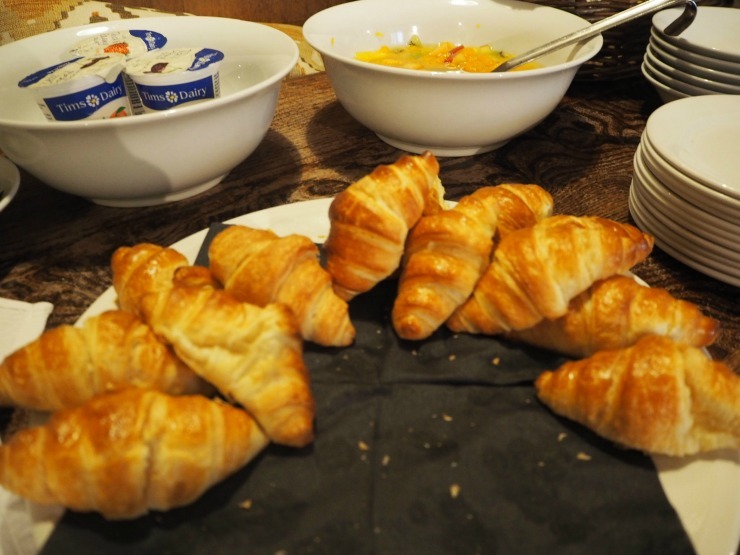 The breakfast consisted of a simple continential choice, with croissants, yoghurts, cereral and fruit and also a cooked to order menu. 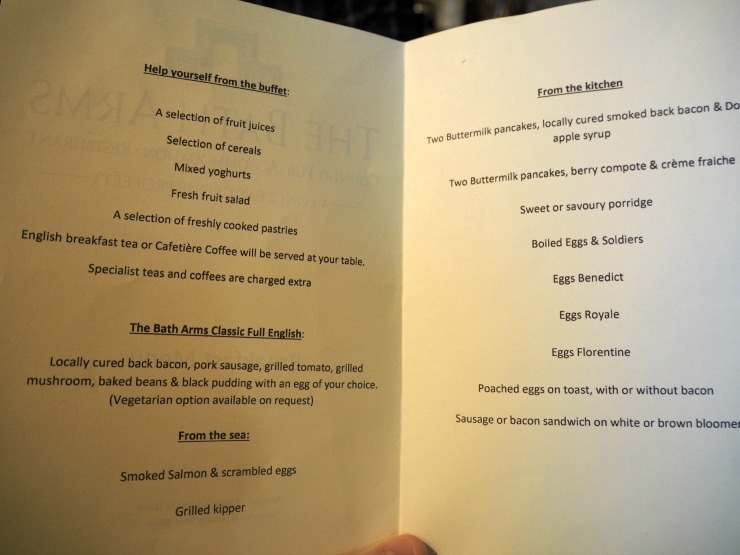 The cooked to order choices consisted of a full English breakfast, bacon or sausage sandwich, buttermilk pancakes, and more. 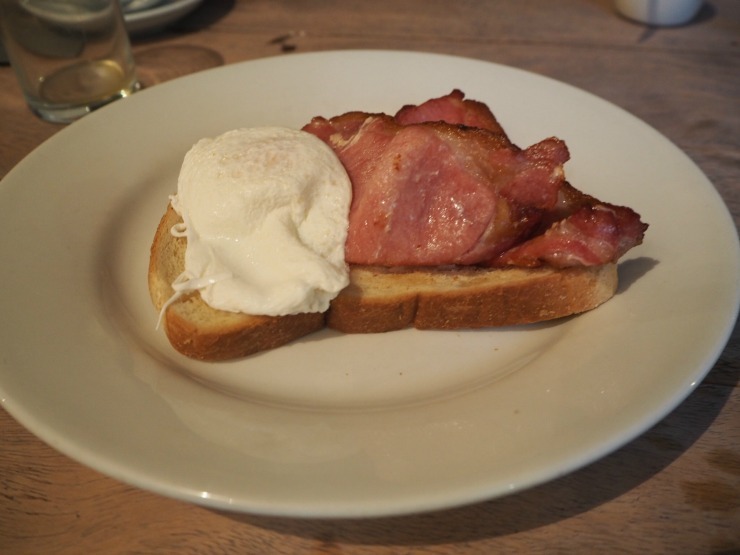 Mr W had poached eggs on toast with bacon and I had a bacon sandwich. I asked for soya milk for my tea and was pleased to see that this was available. The cooked to order breakfast was good however the continental choice was limited - the fruit consisted of tinned mandarins and a little fresh fruit mixed in, the fruit juice was not fresh, and a small number of fruit yoghurts were available with no plain yoghurt. Whilst not a deal breaker this could be a little better I personally feel. We both enjoyed our stay at The Bath Arms. I really liked the room decor, and the evening meal was very tasty. Using locally sourced food is to be highly commended and the menu choices were adventurous with the food beautifully presented. Although not entirely perfect, I think it is a good choice when exploring the area around Longleat. Recommended. This hotel looks lovely. 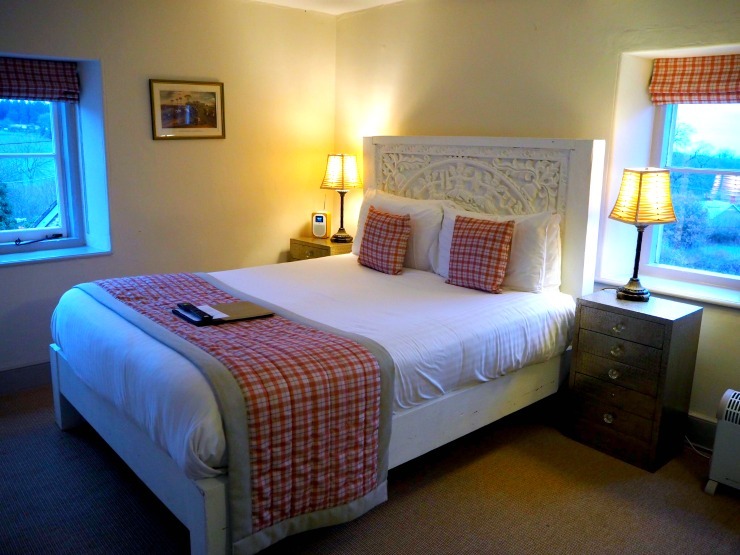 The bedrooms are gorgeous and the food looks wonderful. There is something so quaint and pleasant about a small accommodation like that, and for a fussy eater that menu definitely satisfies my hunger. Gorgeous photos of the place as well. I love old country pubs like this! Oh how fab! 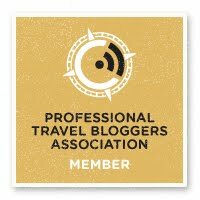 Looks like a fab hotel and so lovely and cosy too! I really love places like this where it's all very homely! What a little gem, your room was so tastefully decorated with some personality. I've never stayed anywhere like this - usually air b n b for us, but maybe we'll have to give it a go! I don't live very far from here, but I've actually never been to Longleat! The Bath Arms looks like a really lovely place to stay. The bed and the bathroom are gorgeous!